This dish is very simple to make. It's a perfect rice dish when you want to serve it as a side dish but don't want to make just plain rice. I cook it with my double-lid donabe rice cooker, "Kamado-san". 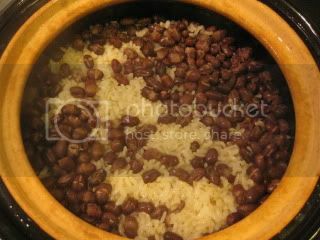 The ingredients are 1.5 rice-cups (270 ml) brown rice (partially polished kind, which can cook like white rice), 1/2 rice-cup (90 ml) sweet rice, 400 ml water (of which 2 tablespoons are replaced with sake), 1 (US) cup cooked azuki beans (I simmer the beans until al dente), 1 teaspoon salt, and a small piece dashi kombu. You add the ingredients to the donabe in the order of rice mixture, salt, water (with sake), azuki, and kombu, and let the mixture soak in water for 30 minutes. Once the donabe is covered with both lids, you can cook it just like you cook the regular plain rice (about 15 minutes over medium-high heat, then 20 minutes resting after turning off the heat). Small amount of the sweet rice gives the nice chewiness to the dish, and sake gives the shiny finish. So easy and so tasty.